Grab your DC Comics books, because your favorite supervillains are back at it again. Homemade Movies makes its epic return with the Suicide Squad trailer, recreated shot for shot. Don’t Breathe buttoned up a sweet, little $26.1 million (estimated) opening weekend box office the final of the summer and it was enough for a dominant #1 finish. The movie, directed by Fede Alvarez, features few stars Avatar villain Stephen Lang is the most established and came together around a relatively tiny $10 million budget. And yet it’s already a moneymaker. A mix of high critical praise and efficient Sony marketing definitely played a role in that. Don’t Breathe earned an impressive 87 percent “Fresh” rating from RottenTomatoes, and trailers have prominently featured hyperbolic pull quotes. It’s the third success story this summer for horror. The Conjuring 2 opened on June 10, surpassing its $40 million budget after one week and rising to $319.5 million worldwide in subsequent weeks. The Purge: Election Year followed on July 1, immediately tripling its $10 million budget in one weekend. That total grew to $105.6 million worldwide in the weeks that followed. Summer is traditionally a good time for horror, but it’s more apparent in 2016 because of all the high-profile busts. Blockbuster sequels like Indepedence Day: Resurgence, Star Trek: Beyond, Jason Bourne and Alice Through the Looking Glass have largely fallen flat during this year’s spring/summer months. These films are all designed to fill theaters, but audiences are opting for more niche-centric fare like horror or comedy (Bad Moms, Neighbors 2, Sausage Party). Family-friendly movies like Finding Dory and The Secret Life of Pets have brought in the crowds as well, but that’s normal for the school-free summer months. Trailing well behind Don’t Breathe is Suicide Squad, now in its third week of release, with an estimated $12.1 million. The DC Comics anti-superhero flick faltered quickly after an opening week surge. It’s now just a little bit shy of $600 million worldwide, and likely won’t climb much higher than that. After Suicide, the rankings get a lot murkier. Five weekend box office totals for Kubo and the Two Strings, Sausage Party, newcomer Mechanic: Resurrection, Pete’s Dragon and War Dogs are all estimated in the $7 million range. That makes the weekend’s final lineup hard to predict, though the numbers are small enough that the final order isn’t very relevant. The biggest takeaway from the weekend’s box office middle ranks comes from Mechanic: star Jason Statham clearly isn’t as bankable as he once was. This delightful comic shows why salamanders are awesome and need our help. Rosemary Mosco has made comics about all kinds of animals, from agoutis to eels. But she says she’s got a soft spot for salamanders. “I feel like everybody has an animal, plant, or other creature that really clicked with them and pulled them in,” said Mosco. For her, it was the blue-spotted salamander. Mosco is a field naturalist, science communicator, and the artist behind the delightful science and nature comic bird and moon. Back in 2015, she made an awesome comic about why salamanders need our help. Bsal is scary for our salamander friends. It isn’t in the United States yet, but people are being super careful about it just in case. Hoping to stop the spread of Bsal, in June 2016 the U.S. Fish and Wildlife Service restricted 200 species of salamander from being imported to the U.S. or carried across state lines. If you need another reason to love salamanders, they help keep our forests and ecosystems healthy by eating a ton of insects and other creepy crawlies, like ticks and mosquitoes. Plus, they are part of the food chain too and go on to feed bigger animals like turtles, birds, and fish! “People protect what they love, and I want to help them love salamanders,” said Mosco. 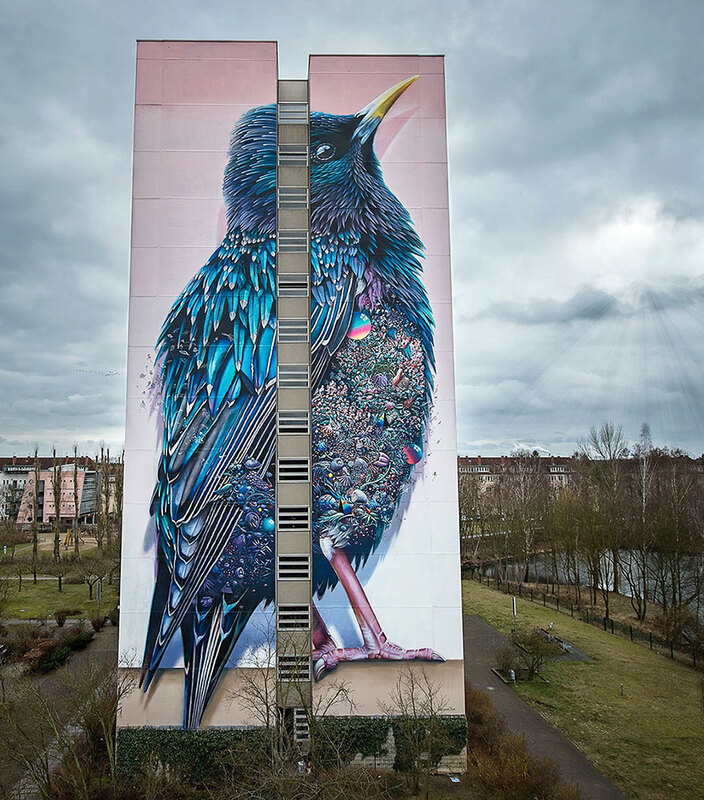 Earlier this year, Netherlands-based artists Super A and Collin van der Sluijs teamed up to create a stunning 137-foot tall mural on the side of a building in Berlin. 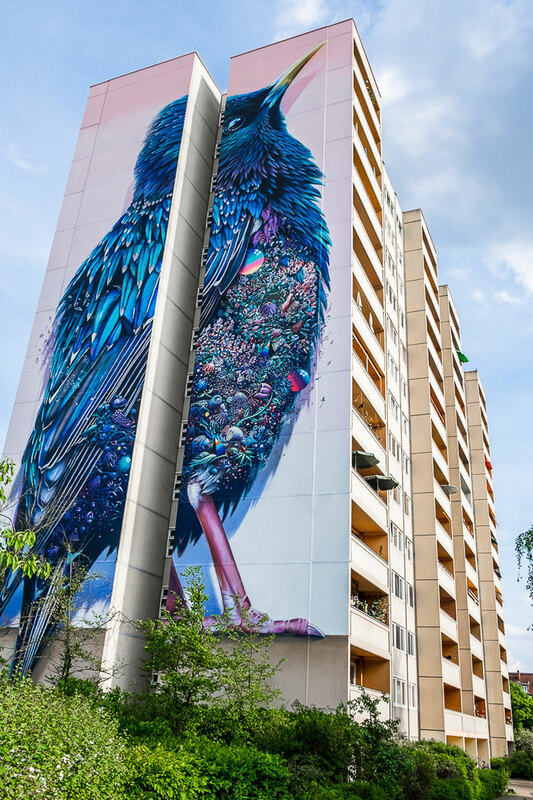 Titled ‘Starling’, the mural shows a massive blue and purple bird covered in feathers. But when you take a closer look, you’ll see it’s covered in not only feathers but all sorts of different jewels and gems. 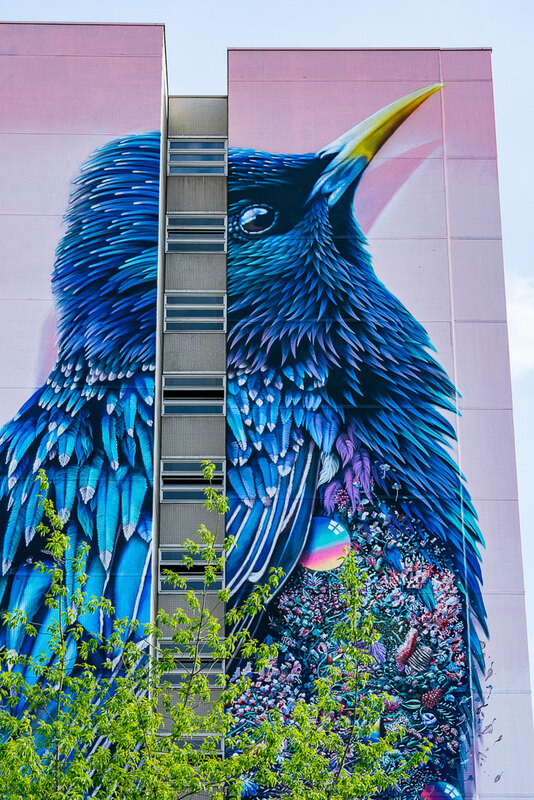 The artists were invited by active urban movement Urban Nation as part of the One Wall Mural Project. So if you’re in the area, be sure to pass by to take a look. 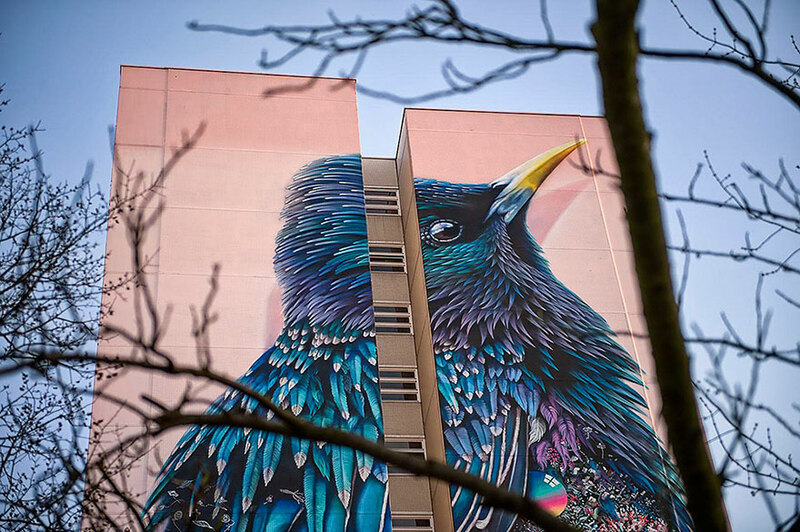 If not, that’s ok, photographer Nika Kramer has taken some detailed pics of the mural! You can find them below.